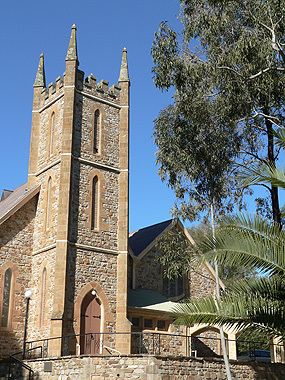 This historic Anglican Church, built in 1852, is one of the oldest in Adelaide. Constructed of local stone, with an imposing tower, it is set in large grounds amidst towering River Red Gums in a quiet leafy suburb. Within twelve years of the opening the building was too small and the southern wall was taken down, arches erected in its place, and the wall rebuilt some 23 feet (7m) further south, thus creating an almost square church. Interior panelling of Australian oak now integrates the two naves into one place of worship. The church features many beautiful stained glass windows and an historic Bishop & Son organ. The priest’s vestry was added in 1871, and a choir vestry in 1899. On each occasion matching stone was acquired from the original quarry site in nearby Brownhill Creek. The Centenary Memorial Terrace in front of the church dates from 1953, and the Rectory was built in 1958. The original Parish Hall and Day School, opened in 1890 in a purpose-built hall on the corner of Princes Road and East Parade in Kingswood, was sold in 1980. A new Parish Hall and Office was then built adjoining the church via a cloister of Basket Range stone. The present Rector is the fifteenth incumbent. A daughter church, St Columba’s at Hawthorn, was opened in 1898 and became a separate parish in 1920. Another daughter church, St Wilfrid’s at Torrens Park, was built in 1934. It closed in 2004 and is now a private home. See the publications page for more information about our Parish History and buildings.